Need more information about booking Home 8504538 ? 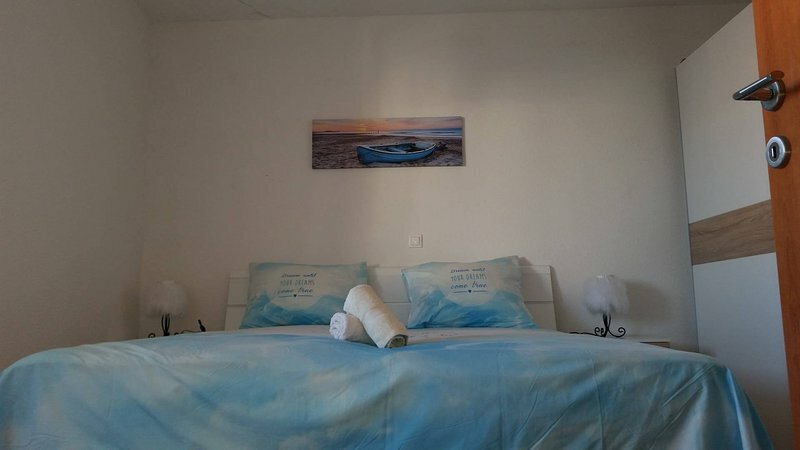 Hello, the house is located in arbanija that a small, quiet fishing village is. ideal to recover from alltagigen stress. the port they can also fish the fisherman to ask fresh. The large one zimmerapartman is approximately 50m tall and also disposes a balcony in the large 20m. shopping venues (supermarket mitmetzger), bus- and boat connection (after trogir) caffe, bar, restaurant, water sports (jetski and boat rental) are close (all 500m). you will see the car undercover garage space. You can get in touch with Kristijan (the owner) through the contact form on this page. Send Kristijan (the owner) an email through the contact form on this page. Alternatively, if there’s a phone number on this page, you can call them. How do I contact Kristijan (the owner)? If you’ve already booked, go to Manage your holiday booking to view Kristijan the owner's contact details or send them a message. Or send Kristijan (the owner) an enquiry through the Contact the owner/manager form if you’d like a quote or more info first. When you pay online through the Book your stay form, a booking request is sent to Kristijan (the owner). You’ll find out within 24 hours whether they’ve accepted - no money will leave your account before then. You can also request a quote from Kristijan (the owner) through the contact form. The owner will email you the total cost for your dates and a link to book and pay online. Use the Book your stay form to pay provisionally online. You can pay by credit/debit card or PayPal. Kristijan (the owner) will have 24 hours to accept the booking and no money will leave your account before then. Why can't I call Kristijan (the owner) before booking? You’ll need to contact Kristijan (the owner) to do this. Send them a message in Manage your holiday booking or through the contact form on this page. You can request to change the dates or number of people on your booking via the Manage your holiday booking page. To change your holiday dates use the Edit booking button. If you need to change the number of guests staying then send Kristijan (the owner) a message. If Kristijan (the owner) agrees, they’ll send you a revised quote outlining the changes. You can review and accept/decline this from the Manage your holiday booking page. You’ll have 48 hours to take action before the revised quote expires.